Cute family, yes? This is Julie Jones. And five beautiful kids. ﻿Kids who look not only beautiful but happy. And these kids are not Julie's. The Atkins kids lost their father two years ago and then lost their mother to cancer six months later. 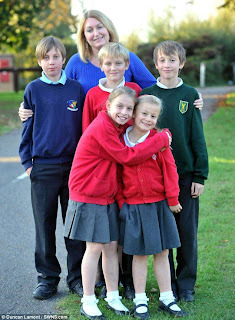 So Julie Jones, already a mother of three grown boys, opted to raise her best friends children. So first and foremost, no child should lose their parent. I am 40 and can't fathom what that day will be like when my parents are no longer alive. These kids ranged in age from 4 - 10 when their parents died. But the bigger picture is to see a picture of a happy family and the realization that all families are not made the same way. And this group found a way to move it forward. As a Mom, it hits me in all the right places the power and benevolence of people. And our general happiness is very contingent upon who is central in our lives. So you already know your 2012 mantra should be "No Toxic People" and we all seem to know one or two. And another mantra should be to be as great of a friend as you can be. Maybe you wouldnt need your best friend to raise your child should there be a tragedy but it made me think not only as a Mom but because I am the best friend to a fabulous woman. MarciaGarcia and I met in law school. We were a tight knit group of eight and operated inseparably during that very academic, very challenging and very fun investment of time and focus. And our friendship has changed and grown from nights were were drinking dollar pitchers of Keystone (don't mock) and dancing to 80s music (you know you love to do this) to raising children. Our philosophies on life compliment one another but doesn't always work in perfect synchronicity. We agree on certain things, we support one anothe regardless and we operate under a very open and honest way of communicating. And I am so lucky to not only have that type of friendship but recognize it. And when we were sipping Keystone Light out of pitchers (way to go, classy time) and bellowing out the lyrics to Electric Avenue, we could not have predicted the adventures ahead. Adventures that include amazing elements of fun (NYC Fashion Week) and life challenges that force you to grow. I admire her so much as a leader, a friend and a Mom at the same time that wise, witty, sarcastic friend I have had for 17 years. And if my son had to go and be raised by my best friend, I know he would be cherished and loved the same way we cherish and love him now. I know he would learn so much and have every opportunity to grow up to be an amazing man. As we get older, it is very easy to make surface level friends. These are the equivalent to the "friend" in class you never talked to after the semester was over, or your post-college cocktail pals from work. Developing real friendships takes work but we all know some friendships are just much easier, more fun and more worthwhile than others. And I love to have a friend who can see me at best and worst, stood in my wedding, was there the day my son was born, is his Godmother and loves our child, cheers me on to run a half marathon, applauds me when I sing karaoke, reads my blog daily, shares ideas, shares recipes, shares fears, tears it up in New York, tears it up in Vegas (my word that trip was crazy fun), stay home and make a family dinner for our kids, shares advice, shares critique when needed, disagrees when needed, guides and responds. The deepest friendships are truly rare. I have learned so much from you MG and know that statement will ring true for decades to come. I hope you have amazing friendships in your life and that the people you love know exactly how you feel about them. From Chicago, enjoy your week. What an amazing woman. Those kids look happy. I am truly blessed in my life when I think about the trials people go through. I do have amazing friends, and an extraordinary support system. When I see these kids, my first thought is, "Where are their grandparents? Don't they have any aunts or uncles?" And whatever the answer is, I realize that they are incredibly blessed to have this woman. My husband and I have so many people in our corner, our bench is so deep, that just within our families we would find more help than we knew what to do with. That I also can name multiple friends who would step up as well truly speaks to the profound gift we have in our relationships. I wish this lovely woman and those beautiful children every happiness. Thank you for the mention. How true it is that to laugh in the face of absurdity and in some measure contribute to the battle for justice is critical to our own happiness. We are a blesed people. Julie Jones epitomizes true friendship at its best. You, JennyMac, are so fortunate to have a life-friend, MG, in whom you can confide, whom you can trust with your innermost self, and who, though you may not always agree, is always your friend. great post, great reminder, and what a fantastic family. Bless them all I say! I can relate. I lost my mother at the age of 14, her funeral was on my 15th birthday. I had 4 siblings younger than me, the youngest was 8 who does not remember much about our mother. My father did the best he could, although at the time I didn't realize it. It was a hard time for us all. Julie is an amazing, wonderful friend and those kids will love her as they love their mom. I have very few 'good' friends (lost my bff a few years ago to a massive heart attack) and I work very hard at being a good friend. The older you get the more you appreciate the true, loyal friends you have. Great post! I'll be honest JennyMac, I have friends. Real friends to a point but then comes the critical moment when there is a need or a hand then it would seem I can't find them. It's OK though I never tried to make any friends or even let anyone in who thought they saw someone they might want to know in until about a decade ago. With the exception of my wife, who knows all I have shown her of me which after 30 years is a lot, only my PCP knows more. Funny thing is I am not an introvert or an extreme extrovert but in a way I can see in what you wrote that I may have missed out on something I have no definition for. Friends doesn't quite fit the thought, music maybe a better word for it. There may be a form of music in the world I just was not born to hear. *shrug* destiny is a a strange and twisted road at times. Be Well and safe in the notes of the music you make. Oh, I tell the people in my life EXACTLY what I think of them, believe me. Wait...that may not have sounded as tender as it was in my head. Maybe I should work on tone. Tone is important. What a lovely ode to friendship, something that I now appreciate every day just a little bit more, perhaps because at 45 I have known these people for a really long time and they are fabulous. I'm lucky, and grateful for everyone of them. This was lovely, sounds like MG is lucky too. Now, get out there and enjoy this very non Chicago March weather! This is a very moving and beautifully written post. I've been blessed throughout my lifetime to have wonderful friends. Some go back decades, like my best friend from 8th grade who I spoke on the phone with this week. I can't imagine a life without the love of good friends.